An All-New Week of Arthur! ARTHUR, television’s longest-running children’s animated series, kicks off its spring season with a week of all-new episodes, including two devoted to the issue of bullying. The week begins with “The Last Tough Customer” on Monday, May 6. In this episode, the Tough Customers realize it’s time to quit bullying and set out to find a new hobby – but can Molly ever truly change her ways? Then on Friday, May 10, in “So Funny I Forgot to Laugh,” Arthur thinks his jokes about Sue Ellen’s new sweater are all in good fun, but Sue Ellen’s feelings are hurt. Has Arthur become…a bully? Since it first premiered in 1996, ARTHUR has tackled a wide range of childhood issues—from asthma and bedwetting, to coping with the loss of a pet. These episodes on bullying further ARTHUR’s commitment to encouraging conversations around tough topics and fostering positive social skills in children. The Tough Customers realize it’s time to quit bullying and set out to find a new hobby – but can Molly ever truly change her ways? Brain starts a chess club at school to improve his game and beat Los Dedos, the local chess master. Who knew the best player in the club would be…Rattles?!? It’s Grebelings season and George can’t wait to play! After all, no one knows more about baseball than George. But when he realizes knowledge of sinkers doesn’t guarantee success in the field, will he throw in the towel? When Brain gets teamed with Buster and Binky in the annual Arithmattack competition, he immediately enrolls Buster in binomial boot camp. Can Brain transform Buster into a mathematic marvel? Or will he be forced to eat humble pi? Lakewood Elementary has just instituted IRP; a program where kids can earn points (and prizes!) for reading. Buster’s thrilled and gets to work straight away! But will he earn enough points for a skateboard? Buster and Brain never agree on movies. Buster rates every film a 10+, while Brain doesn’t seem to like anything…Only one of them can be right…or so they think. The unthinkable has happened! Fern has writer’s block! Fortunately, Ladonna’s full of stories. Faced with a tight deadline, Fern decides to “borrow” the tales and simply change the names. Has Fern confused write and wrong? When Sue Ellen decides to stop eating meat, Muffy and Francine compete to be the best vegetarian. Can they successfully resist meat? Or was this a missed steak? Arthur thinks his jokes about Sue Ellen’s new sweater are all in good fun but Sue Ellen’s feelings are hurt. Has Arthur become…a bully? It’s a beautiful afternoon and everyone is reminiscing about their “best days.” Everyone, that is, except Arthur. Is it possible he doesn’t have one? The ARTHUR website is home to a variety of educational materials, including resources, lesson plans, and activities, to help kids gain a better appreciation for the world around them. Parents are encouraged to use the new episodes, as well as related online resources, to begin a conversation with their children about bullying. Stay tuned for the launch of a new Fashion Club, coming this May! Design an outfit for your favorite character, watch fashion-themed videos, and much more! Visit the ARTHUR website at pbskids.org/arthur and watch video clips and full episodes at pbskids.org/video. 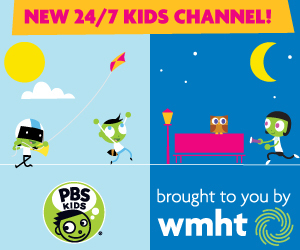 Tune in for a week of all-new Arthur episodes on WMHT beginning Monday, May 6, 2013 at 7am and 4pm. Martha Speaks | Save Burger Boy...The Musical!